Think you can design a better ride than the experts at Epcot? Now you'll have a chance thanks to the defense and government technology company,Raytheon. Today Disney and Raytheon unveiled a new exhibit at Innoventions at Epcot, which will let students design and experience their own ride using math fundamentals. Sum of all Thrills lets park guests custom-design their own ride using mathematical tools, an innovative touch-screen table and a robotic simulator and is the first ride to be located within the newly unveiled section, INNOVENTIONS at Epcot. "Sum of all Thrills is an example of how Raytheon is using innovation to encourage students to develop and sustain an interest in math and science," said William H. Swanson, Chairman and CEO of Raytheon Company. "By experiencing the 'thrill' of math in this environment, students have the opportunity first hand to feel the excitement and possibilities of careers that are possible with math and science. We hope young people and adults alike will enjoy this innovative experience." Sum of all Thrills doesn't stop at the design. When the design of the ride is complete, it is saved on a personal card with a unique bar code. The card will then used to allow each guest to experience his or her custom ride from beginning to end on the robotic KUKA RoboSim 4-D simulator. Inside the simulator, guests experience their ride on immersive high definition video combined with stereo sound and controlled air motion for a complete sensory experience. "Disney parks are well known for their creativity and innovation. Raytheon's Sum of all Thrills is a perfect addition to INNOVENTIONS, which was built in part to showcase cutting-edge technology," said Dan Cockerell, vice president of Epcot®. "This immersive experience, our first-ever INNOVENTIONS ride, will inspire young guests to embrace math and science and the important role these subjects play in our lives." Can't get to Florida? Don't fear, Raytheon as created a virtual Sum of all Thrills experience on-line at MathMovesU.com. The Sum of all Thrills world, aimed at middle school students, combines the three ride elements of the theme park experience into one multidimensional ride. 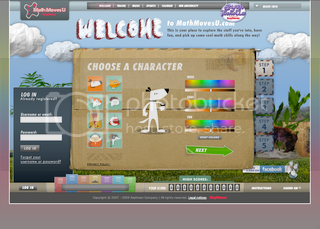 Students answer math-related questions to unlock elements that enable them to build their own ride online. Sum of all Thrills is the latest initiative in Raytheon's MathMovesU program, which is aimed at increasing middle school students' interest in math and engineering by engaging them with the activities they enjoy most, such as sports, fashion and music.